Will you be flying Alaska Airlines with a baby or toddler? As part of my “Need to Know” airlines series for parents flying with infants and young children, here are some important points to be aware of (and be prepared for) before your flight–and possibly booking. Flying Alaska Airlines with an infant on your lap? If you plan to fly Alaska Airlines with a lap-held baby or “lap child,” be aware they make no luggage allowance for unticketed passengers (no matter how cute they may be). That means your diaper bag will count toward your own carry-on bag allowance, or at least toward one of the full-price ticketed passengers in your party. The only exceptions are car seats and strollers as noted below. Make sure to read “The Real Reason Babies and Toddlers Need I.D. on Domestic Flights,”so you don’t get stuck buying a last-minute ticket for your lap baby or toddler at the airport! On Alaska flights originating in other countries, fees will apply for infant passengers and tots under 24 months. The fee is usually around $17 U.S., and an extra luggage inspection fee may apply in some cases (about $2 for Alaska flights from Costa Rica). On Alaska flights from the U.S. to other countries, a fee of around 10% of the adult ticket price will apply to lap-held children. For questions or clarification about your specific flights, you can call 1-800-252-7522 (1-800-ALASKAAIR). If your Alaska flight, or some portion of it, is actually on a partner airline, Alaska requests that you contact that partner airline directly to advise them of your lap child. This way you’ll be sure they assign seats on an appropriate row and any extra fees are addressed if needed. Strollers and car seats may be checked for free on Alaska Airlines. You’ll have your choice of checking them with your checked luggage or at the gate. I always recommend strollers and especially car seats at the gate when possible (more here). If you want help finding an easier way to get your car seat through the airport, see Flying with Car Seats: Seven Easy Ways to Get your Car Seat through the Airport, and check out my recommended Car Seat Travel Bags, Strollers, and Carriers. For lap children: While Alaska does not guarantee free airplane seats for lap-held children, if an extra seat is available on your flight, you might be able to use it for your child. If so, you’ll be glad to have your FAA-approved car seat / CRS with you at the gate, or CARES flight harness with you for your child (see recommended car seats for travel here and read all about the CARES flight harness in my review here). For children in their own seats: Ticketed children using car seats on Alaska flights must have appropriate seats, meaning one that will not block the exit path of others. Generally, this means a window seat or a seat at the center of wide-body aircraft. If you’re not certain, call Alaska Airlines to double check your seating assignments will work: 1-800-252-7522 (1-800-ALASKAAIR). Also, your car seat will need to be cabin-friendly! 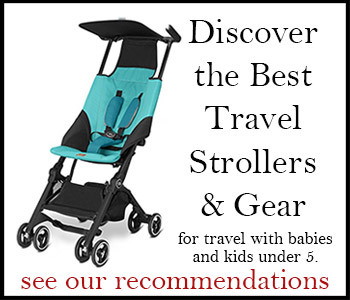 You can see my recommendations for car seats and other travel-friendly gear for families with young children in Great Travel Gear & Products for Traveling Families. Be sure to browse these related features to help with your travel planning and prep! Ask Shelly: Best car seat for flying when kids are too big for the CARES flight harness?